Thank you for your interest in purchasing a pair of SPIKE bindings. OUR CUSTOM BUILT TELEMARK SKI BINDINGS are available exclusively through Jay Cloud Cyclery for the 2016/17 season. Ethan Dahl will do the custom builds. Ethan will provide you with the same line of bindings. I am available for consultation and to answer questions by email only. Our bindings continue to be hand built for individual skiers, with maximum performance and convenience in mind. We base our binding assemblies on boot size, ski dimensions (ski brake width adjustment), skier weight and expertise, touring or lift service. The SPIKE XT is our work horse. 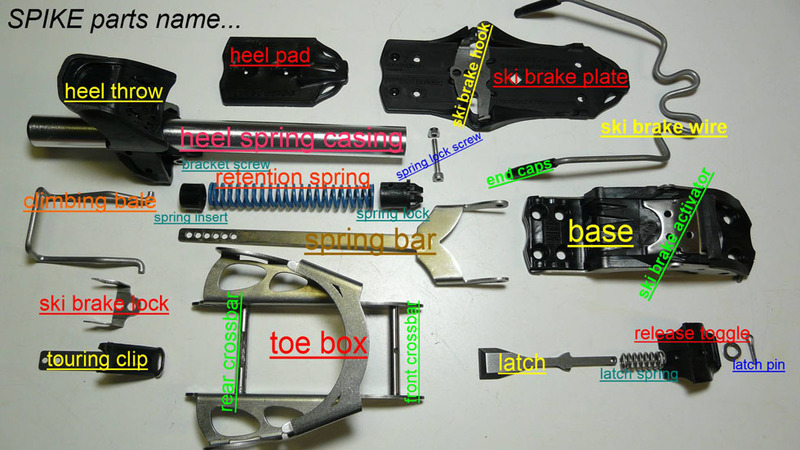 Features a ski brake, single or double barrel heel assembly. Built for power on the slopes and convenient step-in function. It is our most popular binding and a favorite binding for ski patrol. The SPIKE Tour is specifically designed for free pivot touring. Features the characteristic 'bulldog' step-in heel and toe assembly, and pole activated climbing wire. There is a fixed metal plate installed on the top surface of the base that reliably sheds snow in all conditions. It is the lightest telemark ski binding in its class. Intended for free pivot touring and steep climbs. It has a single underfoot retention spring for power and sensitivity skiing the deep. The heel slips off with the tap of a pole or other downward pressure, such as a snow slide, providing added safety in avalanche conditions. The SPIKE 3 pin matches up well with textured touring skis. This year we have added some length to the toe box for versatility with bigger skis. This binding provides a beautiful alternative to heel throw bindings for light weight ski cruising. This binding is based on the same principal of as our original Telebulldog 3 pin binding with toe assembly alone, combined with a ski brake, it is the most convenient step-in binding that we offer. *All weights listed for bindings are based on a standard setup, with standard blue retention springs, a single barrel heel, and with ski brakes for lift service bindings, without for touring bindings.